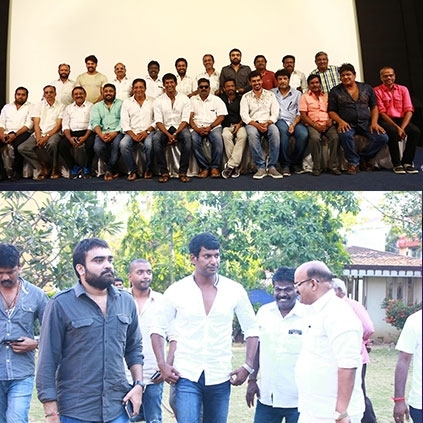 Vishal's producer council team’s manifesto is out! VISHAL'S TEAM’S MANIFESTO IS OUT! It is a known fact that actor Vishal will be contesting in the Producer Council election for the post of President. He along with his team had arranged for a press meet today (5th March) where they had disclosed their team’s manifesto which is as follows. 1. To release films that are left unreleased and to make every film earn revenue through satellite rights. 2. Cable TV revenues will be adjusted properly and will be ensured that all producers receive their share of revenue on a monthly basis. 3. To take necessary steps to get the long-pending government subsidies to all producers. 4. All films will be treated equally without any discrimination based on its budget and will be given equal importance to all problems which will be resolved within a week. 6. Residential plots will be provided to all producers. Expenses for this scheme will not be taken from the council’s savings but through new revenue generating ideas. 7. Pension amount increased from 5000 to 10000 for senior members over 60 years. 8. Diwali gift of Rs 10,000 / - will be paid to all members through their respective banks a week before the festival. 9. Pongal gift of Rs 10,000 / - will be paid to all members through their respective banks a week before the festival. 10. Steps will be taken to provide free higher education to children of all association members. 11. We will not be selfish or act with any vision like our predecessors did. 12. All these promises will be fulfilled within one year else we will be resigning.